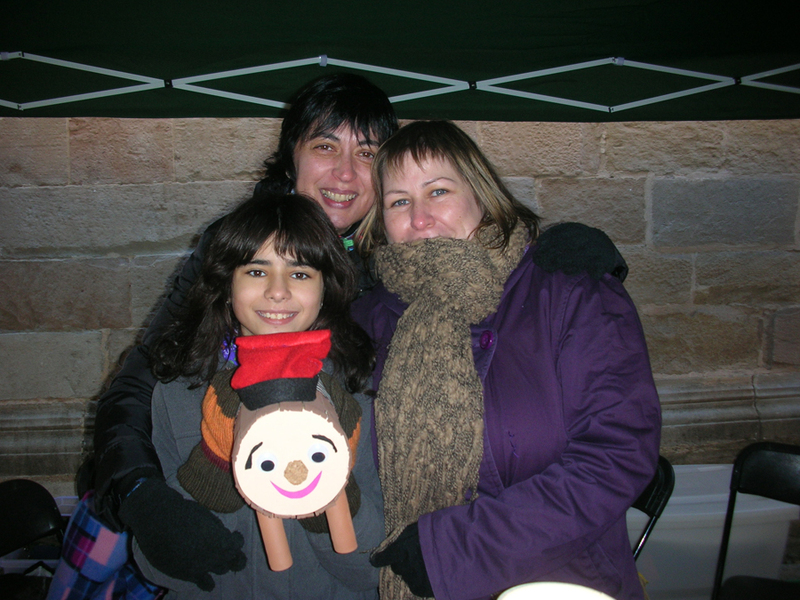 We are going to the Christmas Fair in Igualada. This December we continue going out to keep raising funds to afford Àlex’s treatments to mitigate his Autism Spectrum Disorder (ASD). 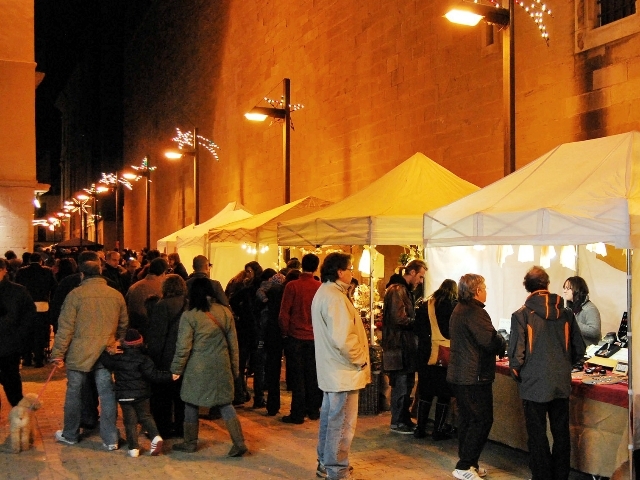 The weekends of December 6th and 7th, 13th and 14th and 20th and 21st, the 37th Christmas Fair is held in Igualada. It takes place in a traditional space in the old city where dozens of stalls sell all kinds of products related to the Christmas traditions. You can find us the days 7th, 13th, 14th, 20th and 21st from 10AM until 9 PM in our stand with all the association customized products, Christmas Lottery and…. a great surprise! 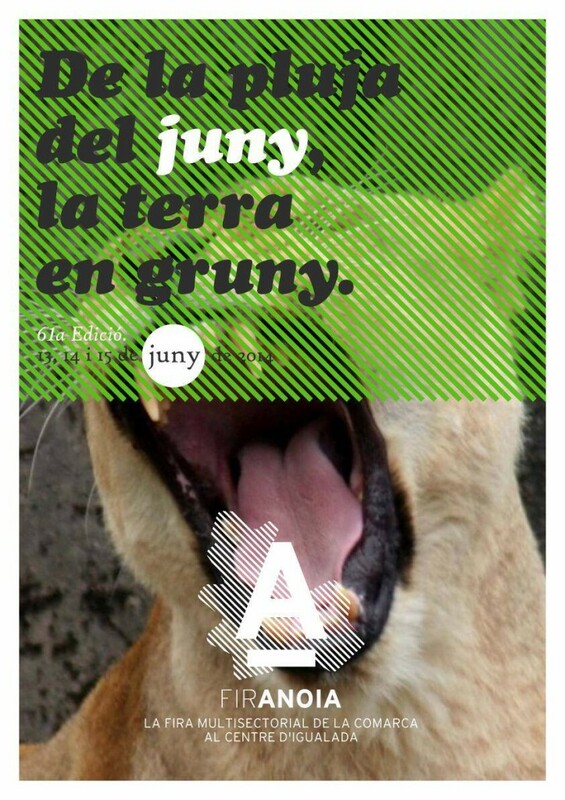 Our participation has been possible thanks to “Fira d’Igualada” and the Festival Committee of the Font-Vella district. They are the organizers of this Christmas fair, whom we thank for their disposition and help to continue making our initiative known. 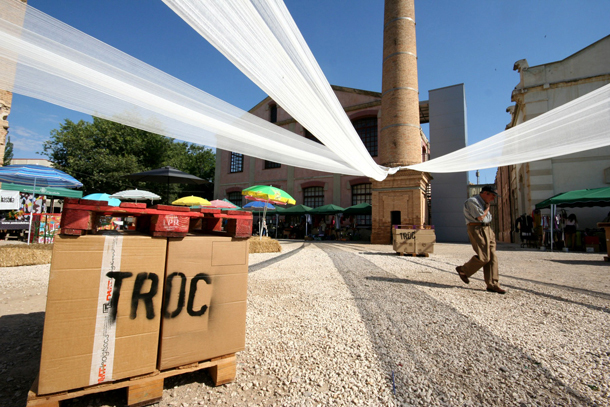 This Saturday, the third edition of “Troc” is going to take place in Igualada. It is a exchange market, a space for exchanging, sharing, and re-selling all kinds of items we have at home and are no longer useful for us. 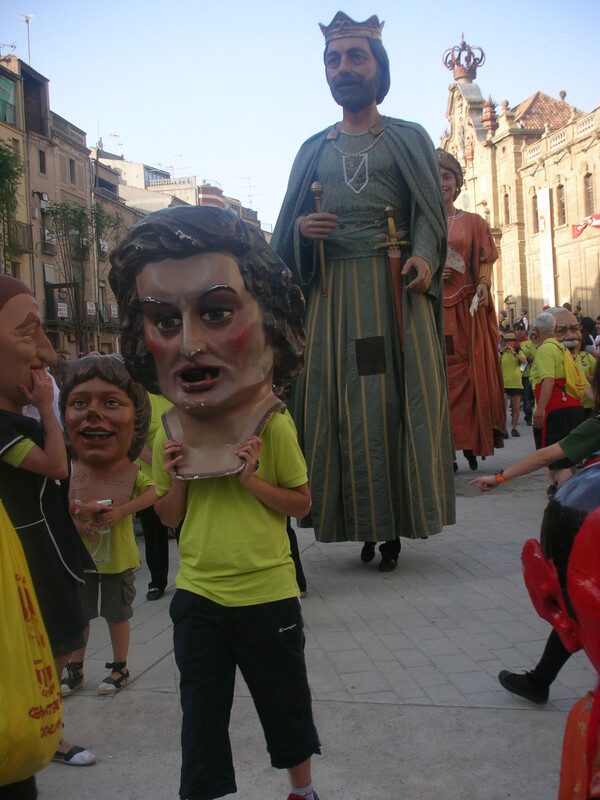 The “Troc” is open to all citizens, and it takes place this Saturday, June 21st in Igualada. We will also participate in the “Troc” to continue promoting our initiative; as well as continue seeking support and raising funds to help Àlex. 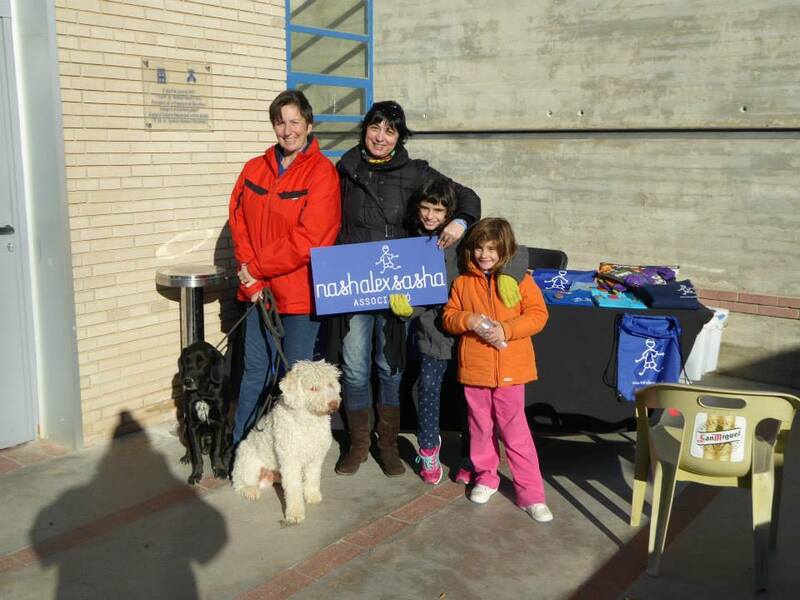 We’ll be holding the event all day long at the Leather’s museum courtyard of Igualada, from 10 a.m to 8 p.m, and will be attended by families and non-profit entities. There you can find us in our stand with solidarity and personalized items. The day will be marked by a familiar and popular atmosphere. There will be some activities such as the performance of JoKB (a musical group from Igualada who were already on our second charitable party) at 12pm., A workshop of crafts with recycled material held by the Àuria’s Foundation, between 11 a.m and 13:30 a.m and a workshop of plastic, between 17h and 20h. The “Troc” market will also have bar service. 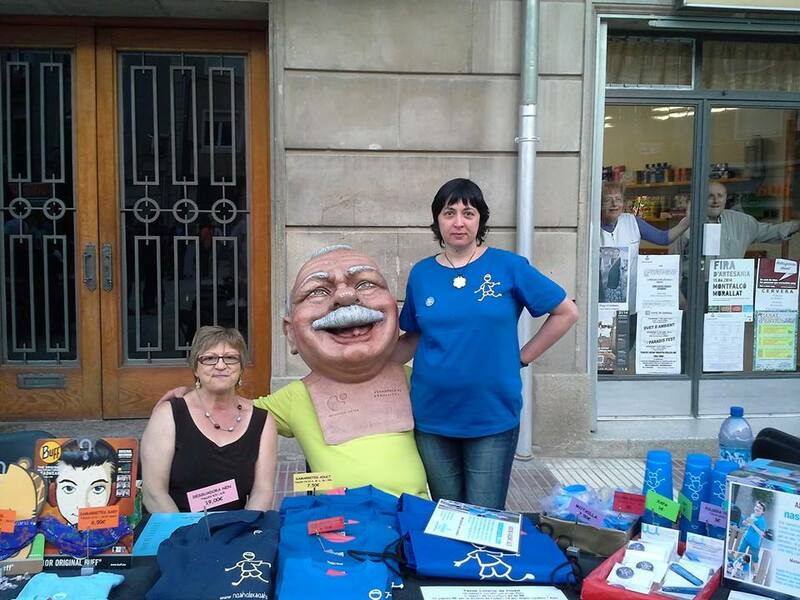 This weekend we face the third consecutive weekend doing activities and having presence on the streets to continue helping Àlex. 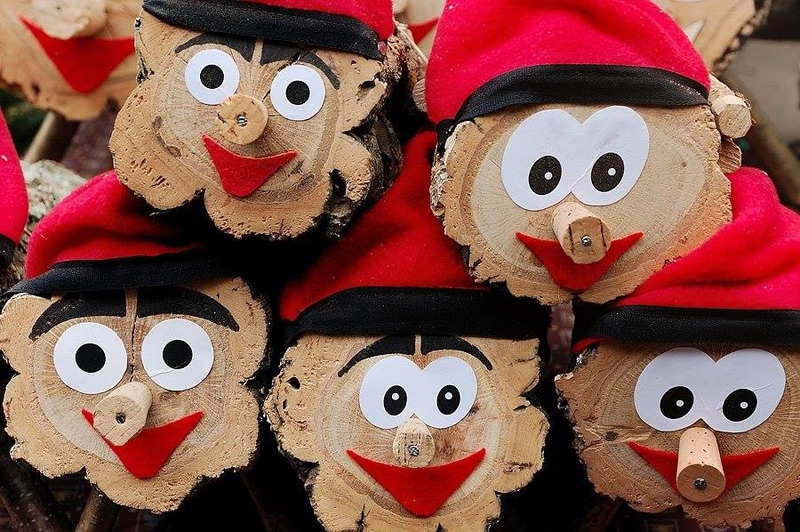 After being in the Craft market “Peces Puces” in Igualada and “Ciutat Gegantera 2014” in Cervera, this Saturday and Sunday, 14th and 15th of June, we will participate in the Entities’ Fair, which belongs to “FirAnoia”, the main multi sectorial fair that takes place in Igualada. It consists of a gathering of companies, entities, artisans, etc. and also a party full of activities addressed to the general public. The “FirAnoia”, which is organized by “Fira d’Igualada”, will take place the days 13th, 14th and 15th of June in the central streets of the city. 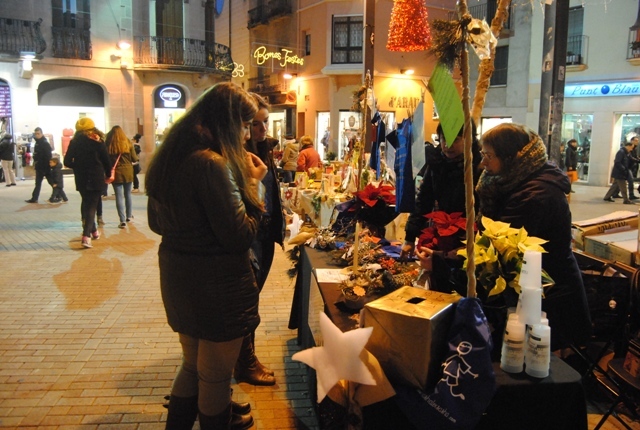 We will be in the entities’ space, in Òdena’s Street, together with other organizations and nonprofit associations. You can find us on Saturday and Sunday from 10 to 21 hours and find our solidarity customized items and the Christmas lottery. 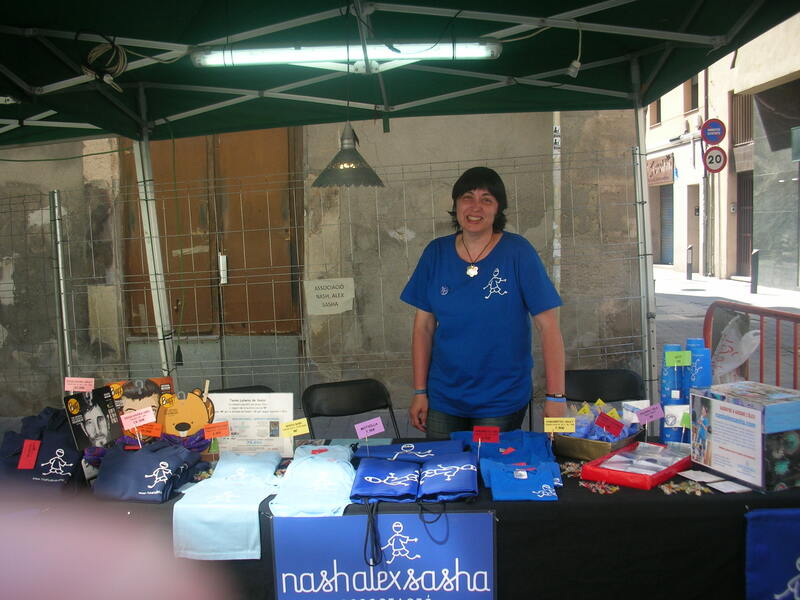 On Saturday May 31 we were in the Peces Puces craft market held in Igualada to continue raising support and funds to help Àlex. Although the weather was not good, we are very pleased to have been in this market. Rain and wind spoiled a day and a market very well organized by our friends of la Bastida. However, we can make a good evaluation of our participation in this event. Despite having only the morning, we were able to present our initiative to attendees, getting their support and esteem. 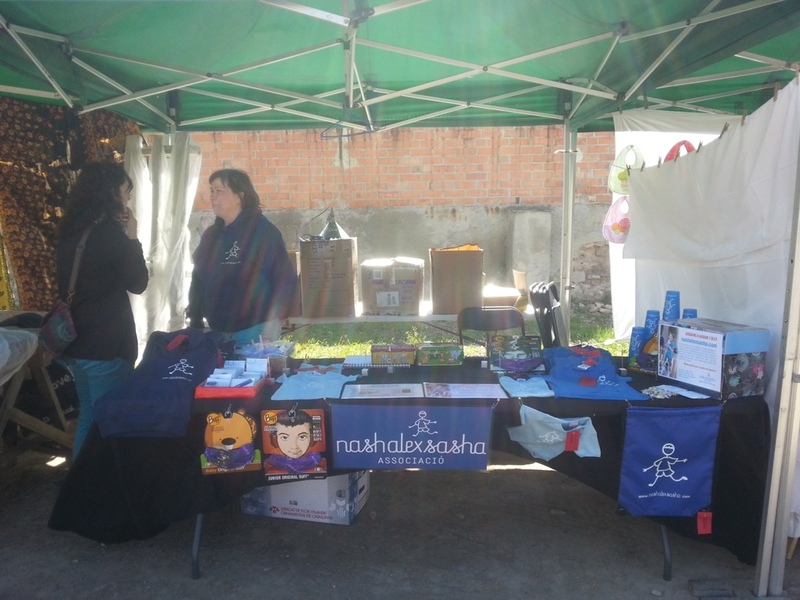 Also, many people were interested in our merchandising and numbers of Christmas Lottery, a part of the donations that will allow us to continue helping Àlex. This is what comforts and encourages us to keep fighting. 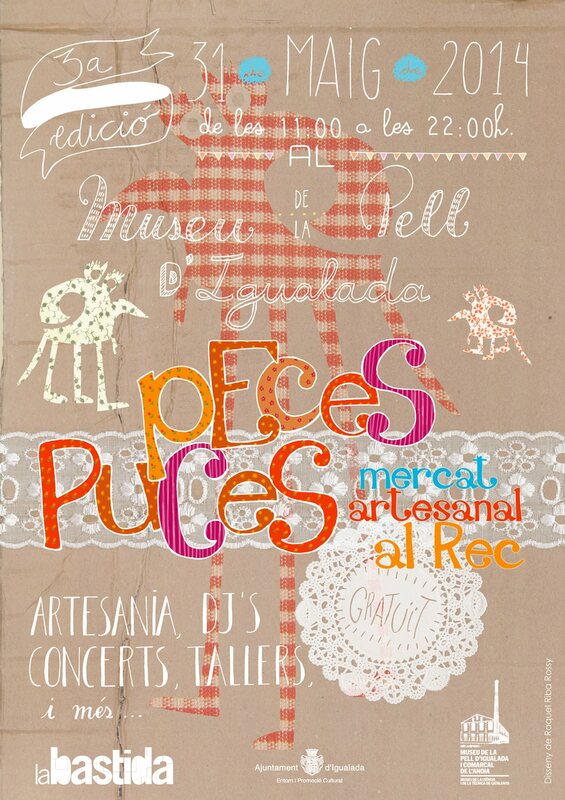 This Saturday May 31 we will be at the third edition of the Petites Puces handmade market, a meeting hold in Igualada (Barcelona) where you can find a great selection of artisans, artists and activities for all family. Dozens of artisans will show attendees their best creations and works. Plus, you will fin live music, workshops and activities for children. 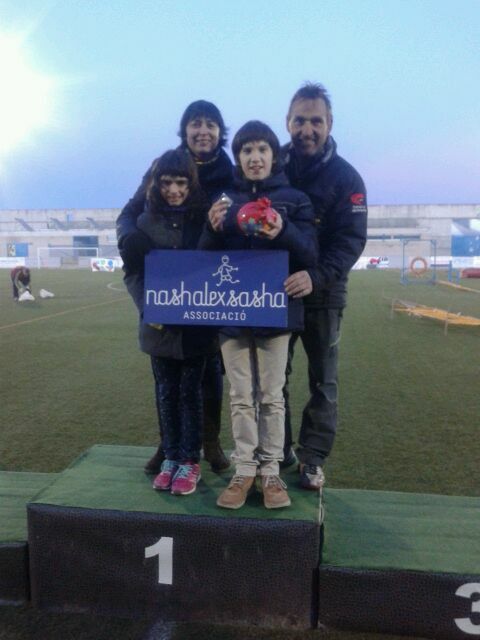 This year, the Associació Nash Alex Sasha, will have our own space together with others associations. We will show our initiative, we will offer our solidarity custom items and we will try to find more complicities between all attendees. Join us in this market and we will tell you the latest news from our initiative and Àlex’s progresses. The Petites Puces show will be held all day Saturday, from 11 to 22h, next to the “Museu de la Pell d’Igualada”, next Barcelona. 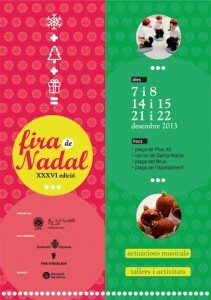 The Petites Puces event is organized by la Bastida, who collaborated on our first party for Àlex. It’s a great pleasure to announce that we have collected 911,16€ to keep the treatments for Àlex at the party we had done the past 5th of October! 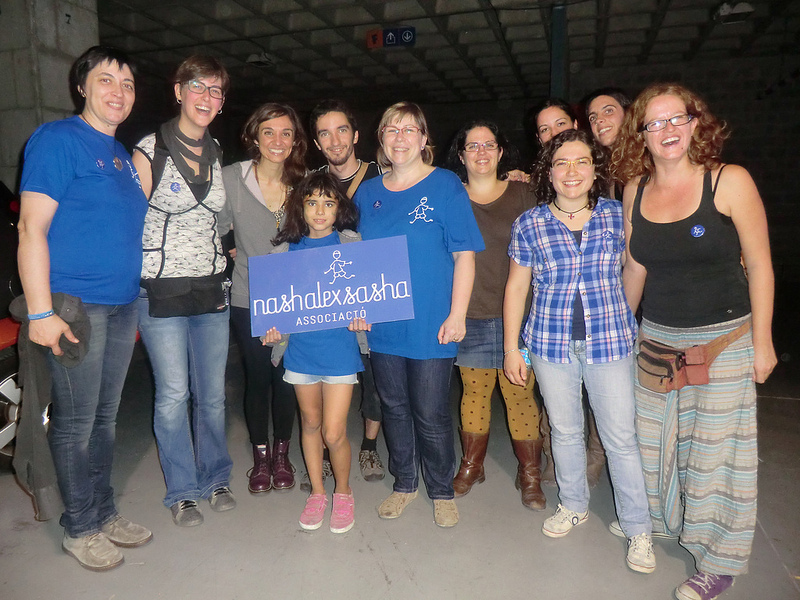 We are very grateful to all the people who had helped and participated in this great party! Undoubtedly, you have made possible this result. The 911,16€ that we have collected have been added to the money we have achieved during these months, either by the charity bracelets, by your contributions you have made ​​to our account or by the money we had collected at the first party for Àlex at laBastida few months ago. Thanks to those efforts, Àlex can continue to receive the psychotherapeutic treatments needed to mitigate the Autism Spectrum Disorder (ASD), to get a better life, and keep having happy and fulfilling life. We sold 365 tickets in this second party that we did at the Cal Carner space, Igualada. We had expected to sell more tickets and get more public, but despite this, we are very grateful to all people who came. 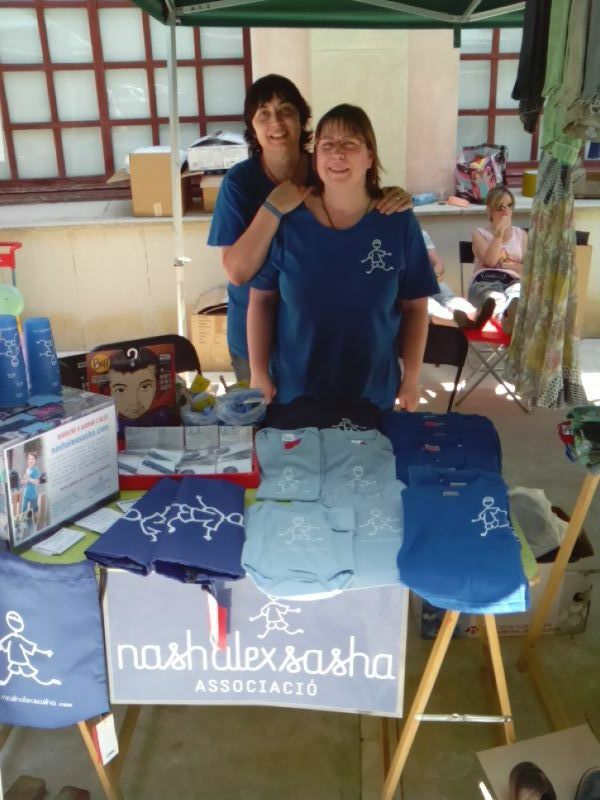 In this party, we could continue spreading our work and promote our Nash Alex Sasha association to the city. The one who really enjoyed the party was Àlex himself. He stayed at the party all day long, from 11AM to 11PM. He didn’t realize why the party was organized, but he had a great time, as the same as Vika, her sister, who also participated. For us, see Àlex so happy offset all the tiredness and exhaustion and all time we take to prepare the party. We want to express eternal gratitude for all the people who came to the party, but also the musicians and artists, volunteers and supporters who, in charity, worked at the party and help us to help Àlex. Without you, this would not have been possible. That is why want to appreciate your dedication to sharing with you all the people and companies who have worked with us. 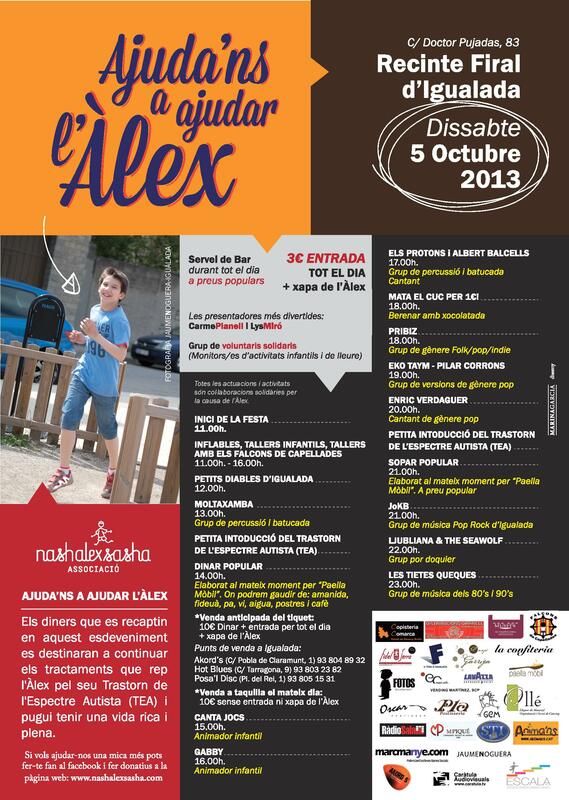 On Saturday October 5th you have a new festival for helping Àlex. This Saturday, we are having party at the Cal Carner space with music, popular meals and activities for all the family. This festival aims to raise more money for Àlex, so we can keep the treatments for the Autism Spectrum Disorder (ASD). After having a fantastic party at laBastida last June and creating the charity bracelets, we have organized this new party, which will starts at 11AM at the Cal Carner space (C/ Doctor Pujadas, Igualada). You will find activities for children, workshops, percussion bands, child entertainers, popular meals and music performances during all afternoon and night. If you wish, you can also buy the meals tickets in advance. They cost 10€ each. All the income (from the meals and tickets) will be destined to keep the treatments that Àlex is receiving in order to fight against the Autism Spectrum Disorder (ASD). We hope to help Àlex and make his life better and richer. 11.00h – 16.00h Inflatable mattress, workshops for kids and workshop by the Falcons de Capellades. 13.00h – MoltaXamba – percussion band. 13.00h – Little introduction to the Autism Spectrum Disorder (ASD). 14.00h – Dinar Popular, popular meal. 15.00h – Canta Jocs – child entertainer. 16.00h – Gabby – child entertainer. 17.00h – Protons & Albert Balcells – percussion band and signer. 18.00h – Mata el cuc per un 1€ – chocolate snack. Little introduction to the Autism Spectrum Disorder (ASD). 21.00h – Sopar Popular, popular meal.